‘Unsurprisingly, the burden was most intense in Asia and sub-Saharan Africa and fell most heavily on children under five years of age. But surprising to many, most of the known burden comes from microbes and worms and not from the chemicals people tend to worry about more (although the study is not complete, and results are anticipated showing a high burden from heavy metals). ‘. . . A new report by the World Bank launched this week provides first estimates of the economic burden of foodborne disease. The total productivity loss from foodborne disease (that is, loss in terms of human capital) in developing countries amounts to US $95 billion a year. ‘Fifteen countries, led by China and India, have an economic burden of more than $1 billion a year. Adding the costs associated with treatment adds another $15 billion to the bill. Losses associated with trade, long the major focus of donor investments, may be an additional $5 billion a year. written by Delia Grace Randolph and others. An important, if not cheering, finding from the report was that for many developing countries the burden of foodborne disease is likely to get worse before it gets better. ‘According to “the food safety lifecycle” food safety will first worsen then improve, driven by shifts in demand and supply that occur along with population increase, urbanisation and increasing wealth. . . . This important World Bank report sets out a range of practical recommendations that can speed the transition to a safer food system. Importantly, consumer demand for safe food is a key lever. Read the whole opinion piece on the website of the Global Alliance for Improved Nutrition (GAIN): The Safe Food Imperative—after years of under-investment in food safety, new shoots are appearing, 6 Nov 2018. Read the new World Bank publication, The Safe Food Imperative: Accelerating Progress in Low- and Middle-Income Countries, written by ILRI’s Delia Grace Randolph and others. Read related articles on the ILRI News blog: Call to improve food safety in low- and middle-income countries—From hazards to risks and from farm to fork, 28 Oct 2018, and New World Bank report says food-borne illnesses cost USD110 billion per year in low- and middle-income countries, 26 Oct 2018. 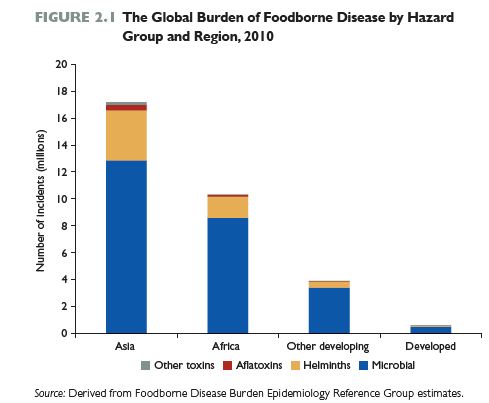 Read the earlier science paper: World Health Organization global estimates and regional comparisons of the burden of foodborne disease in 2010, PLOS, 3 Dec 2015. Tags: Delia Grace Randolph, GAIN, World Bank. Bookmark the permalink. Previous post ← Thanks to CGIAR funders of research for sustainable livestock!